What better way to mark Pink Shirt Day than with a bilingual ventriloquist? It may seem like a bit of a contorted setup, but then, for “stunt ventriloquist,” Tim Holland, that works just great. Speaking to students and staff at Queen Elizabeth Public School in Perth on Wednesday, Feb. 22, Holland said that being a bilingual performer “has been my biggest strength,” as well as being “a great asset, a real gift.” As a performer, he saw the power of bilingualism firsthand when he took to the stage in Montreal. “All of the performers were speaking bilingually,” in both English and French, he said. “Everyone could enjoy the show together.” During a later performance, he was touring Europe with a motley crew that included a musician, a sword swallower, and a mime. “Only me and the mime could perform in Paris,” he joked. Now, “I can do this show in French and it is really fun,” he said. Further to this, learning French has helped him learn other languages, like Spanish. “A lot of the sounds and verb conjugations are very similar,” he said. He also commended the students for taking part in Pink Shirt Day, saying that “we all deserve to be our best, unique selves,” in either official language. The dramatic show highlighted the importance of conversational French utilizing his puppets as cast members. 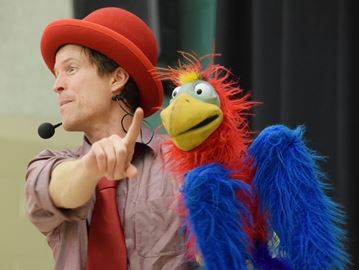 Our students were thoroughly entertained and enjoyed the oral French comedic component with his puppets.